Just Shutters has always had a certain style, an elegance, a difference from the run of the mill; we are individual. 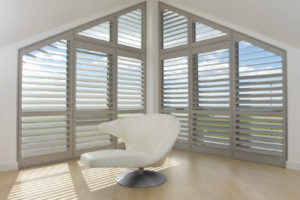 We are not blasé, our shutters are made to measure perfectly. You will never hear us say “oh it does not matter the divisions don’t match the windows, you will just open them like curtains!” We know from many years experience that the panels are only regularly opened in certain situations such as doorways. You can be assured, we care, we have passion, we are honest and will always do what looks amazing not what is the easiest to fit! With most windows, beautiful wide, elegant panels are very much the order of the day. Wide louvres and light colours give the most beautiful light; reflected into the darker corners of the room and up onto the ceiling. It is this reflected light that makes shutters so special. Our style gives this beautiful ambience, this elegance, these understated good looks and desirability. Our style still gives the privacy and sun control so often desired. It also means that windows are still very accessible to be opened or cleaned. Our style still makes the most of a window sill as the panels need to be opened less, while being placed as deeply into the recess as possible; further making the very most of light and space. We have an individual style, we have elegance and a lightness of touch. This is coupled with the way we skilfully install our wonderful creations in your house. Our plantation shutters will look like they have always been a part of your home. Our style means a beautiful touch every time. We are Just Shutters.